Bottom line: A supermajority, or something close to it, of the new Egyptian parliament will be Islamist. Wonderful. Egypt’s Christians are second-class citizens. They were second-class citizens during the rule of Hosni Mubarak, and they aren’t remotely likely to acquire new rights after his fall. Christian Student Murdered By Muslim Classmates for Wearing a Cross: "The teacher nearly chocked by son and Muslim students joined in the beating"
Read more about Christian Student Murdered By Muslim Classmates for Wearing a Cross: "The teacher nearly chocked by son and Muslim students joined in the beating"
"Encirclement by angry Islamists is no longer the nightmare of a few Jewish paranoids"
“Prime Minister Benjamin Netanyahu has already asked the United States and other countries to make it clear that any new Egyptian government must not be allowed to abrogate its longstanding peace treaty with Israel.” Crusades redux: Will Jerusalem soon be surrounded by hostile Islamists? Read more about "Encirclement by angry Islamists is no longer the nightmare of a few Jewish paranoids"
Republished with permission from Baptist Bulletin Mar/Apr 2011. All rights reserved. 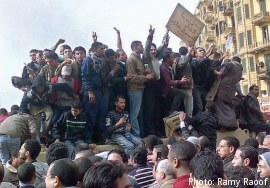 Riots erupted in Egypt in January, an explosion of popular anger that seemed to have little warning. Protesters demanded the ouster of Egyptian President Hosni Mubarak, demanding a new government that would address issues of police brutality, free elections, political corruption, and a stagnant economy. Believers who watched the news unfold considered Egypt’s place in Bible prophecy and its relation to the nation Israel. I will not soon forget that hot Egyptian afternoon, Aug. 5, 1952, when I climbed 450 feet to the top of the Great Pyramid of Cheops at Giza. How did this wonder of the ancient world get there? Two-and-a-half millennia before Christ, tens of thousands of workers spent more than 20 years gathering 2.3 million blocks of stone—some weighing up to 15 tons—on a base covering 13.1 acres to prepare an eternal home for their Pharaoh-god. What brilliance this took! What dedication! Remember, this was not long after the dispersion of mankind from the Tower of Babel, when the Egyptians demonstrated their amazing building skills along the Nile River. "[The Muslim Brotherhood's] prestige in the professions provides it with a major platform for its future ambitions." Read more about "[The Muslim Brotherhood's] prestige in the professions provides it with a major platform for its future ambitions." "I think as time goes by there's more understanding that the two parties have a lot more in common than they have differences"
Do Egypt’s Evangelicals Get Along with the Coptic Orthodox? Read more about "I think as time goes by there's more understanding that the two parties have a lot more in common than they have differences"